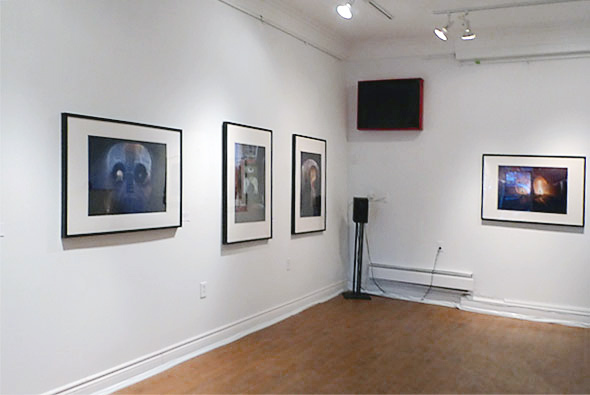 Gallerywest is one of Parkdale's survivors, having risen from the ashes of the closure of gallery DK . Behind the space's resurrection is Saskatchewan native and multimedia artist Evan Tyler. 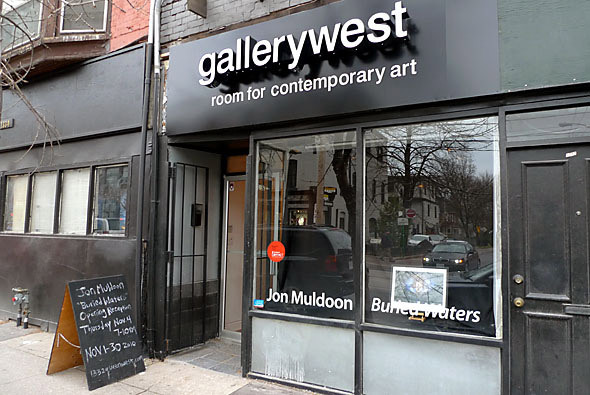 As Gallerywest's proprietor and current sole staffer, he's making an earnest go of running the space at 1332 Queen West, after its previous tenant closed up shop during the summer. 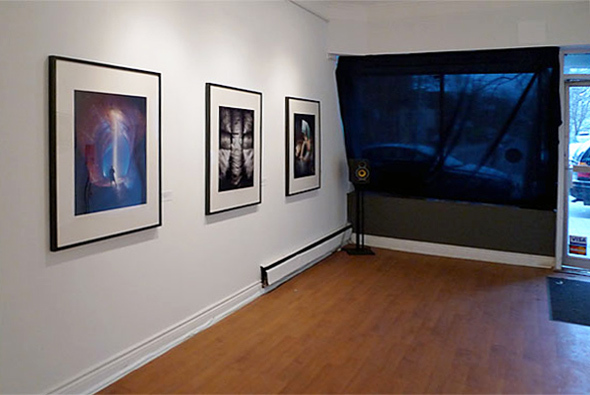 The room itself is modest: a fairly typical, small, Parkdale storefront with white walls and mock-hardwood floors. Its large front window is draped with a black cloth, creating a separate spot for one piece of work to act as a teaser, enticing passers-by into the gallery. The name "Gallerywest" refers both to its location in the western part of the city, and to the programming that's lined up, which features a strong showing of western Canadian artists. Being more familiar with the art scene in that part of the country, Evan's plan is to exhibit works by artists from Saskatchewan, Alberta, and British Columbia in an effort to help them earn more recognition in Canada's largest city. And, he's not shy about letting his Regina pride show. While the desire for growth prompted him to make the move to Toronto, he retains strong connections with the prairie provinces, and he emphasizes his admiration for Regina's artistic fertility. "Often in smaller cities, there's a great sense of community, and a feeling of having a common enemy," he laughs, referring to conservative types who aren't fans of visual arts. "That makes for a really fun and collaborative art scene." Sense of space, physical and psychological geography, and exploration, are all themes around which Gallerywest's exhibitions are loosely based. 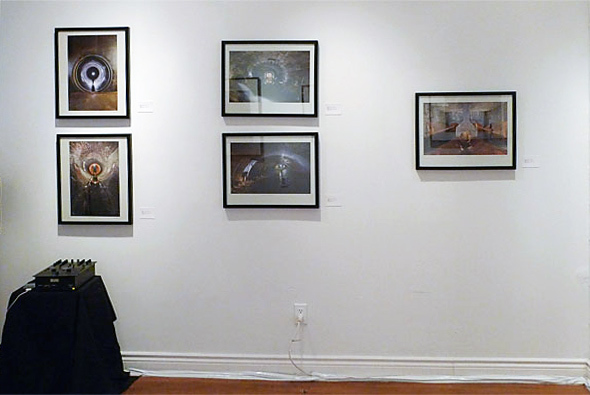 All types of media are shown in the space-- I visited at the tail end of an exhibition of urban-exploration photography by Jon Muldoon, who took his camera and lights with him on journeys into Toronto's subterranean sewers and water systems. Next up is an exhibition by Regina-based Kirsten Smith, whose installation "Unearthed" will explore the tension between urban and rural landscapes. Gallerywest's main challenge has been attracting visitors. It's not too surprising -- most independent Toronto galleries don't experience a lot of foot traffic and visiting can also be difficult due to somewhat spotty hours, and a minimal amount of information on the gallery's website. However, having only been open for two months (as of my visit), and having limited resources and only one staffer, it's certainly forgivable. It's wise to call to check that they're open before making the trip. Evan's route to 1332 Queen Street West was serendipitous. He exhibited some of his artwork there early in 2010, while still based in Regina, and had come out to Toronto for the show. Even then, there were murmurings from DK Gallery's directors that the end was near, and Evan jumped at the chance to take over the space. "I'd been looking for the right reason to move to Toronto," he says, "and it was perfect timing." Far from being an art gallery greenhorn, Evan brings with him a wealth of experience gained through leading tours at Regina institutions MacKenzie Art Gallery and Dunlop Gallery, but he says he had to learn the business side quickly. Even so, his background as a tour facilitator is clear-- he's keen to show me around the small space and tell me about the works on the walls. When I entered the gallery, I noticed the absence of contextual information, but after chatting for a few minutes, it's clear that Evan's friendliness and gift of gab are pretty good replacements for a wall text... and in the small room, that means more space for hanging the work on the walls. Of the gallery, Evan compares Parkdale's community spirit to the friendly scene he left behind in Regina. Neighbouring businesses have watched the space change hands, and Evan says they seem to appreciate having a gallery on the block. Here's hoping the space will benefit from its director's enthusiasm and tenacity, and the community's support. Writing and photography by Elena Potter.